Specialtee Herbal Tea. To detoxify the system. Senna & Mint flavour. One cupful to be taken at night, for up to 4 weeks. Each bag is sufficient for one cup. Prepare by pouring boiling water over the teabag and allowing to infuse for 5 minutes. Senna leaf, peppermint leaf, birch leaves, stinging nettle. This range of specialtees has been developed over many years experience and represent the ultimate in quality herbal teas. Ingredients are harvested in areas known to be free from pesticides, are caffeine free and certified free from heavy metals. The filter bags are made from unbleached paper pulp and are therefore light brown in colour. 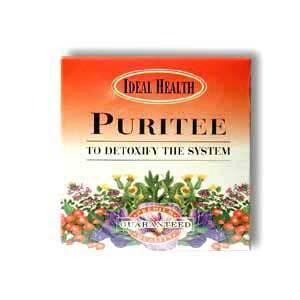 Click the button below to add the Ideal Health Puritee 10 bags to your wish list.